Bangkok Dusit Medica is part of Health Care Equipment and Services business, which is part of Health Care industry. Bangkok Dusit Medica is a company from Thailand, and his stocks are publicly traded. Bangkok Dusit Medica paid a total dividend of 5,640 million THB last year, for a market value of 388,517 millions (Market Cap 217,564 millions). Dividend per share of Bangkok Dusit Medica is 0.36 THB, and his stock market price 24.80 THB. 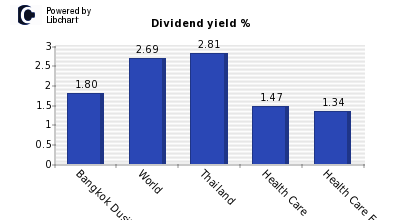 According to the chart below, where dividend yield is displayed, Bangkok Dusit Medica has a dividend yield of 1.45%, which is lower than the amount offered by the market average , but bigger than Health Care industry. Dividend yields are similar among companies from the same industry, so it is a positive sign for the company. In addition, you should compare Bangkok Dusit Medica dividend yield with other Health Care Equipment and Services companies or firms from Thailand. About the ability of Bangkok Dusit Medica to maintain his current dividend of THB 0.36 per share, an amount that accounts for 1.45%, we should study its payout ratio both on earnings and on cash-flows (see chart below). Bangkok Dusit Medica payout on ernings is currently 53.73%, which is higher than the market average, and companies of Health Care industry, which are 40.41% and 28.58% respectively. Both figures show that Bangkok Dusit Medica can have problems to keep with his present dividend yield. The payout on earnings should be complemented with the payout on cash flow since it is this last amount the one which can be distributed to shareholders. Cash flow per share of Bangkok Dusit Medica is THB 0.73 per share, which is higher than the dividend per share paid by the company of THB 0.36, so the company generates enough cash to maintain his dividend in the future. The following figure shows payout ratios over earnings and cashflow of Bangkok Dusit Medica, compared againt world market average, Thailand companies, Health Care industry and Health Care Equipment and Services sector companies. Finally, last moth Bangkok Dusit Medica showed a return of -7.30% compared to a worldwide -5.60% average, and a -7.73% of Health Care firms. Over the last year, the company obtained a 18.70% versus a worldwide performance of a -11.41%. More detailed information can be seen in the following graph for Thailand and Health Care Equipment and Services firms. Bangkok Expressway a. Thailand. Industrials. Bangkok Life Assuran. Thailand. Financials. Bank Central Asia. Indonesia. Financials. Bank Danamon Indones. Indonesia. Financials. Bangkok Bank F. Thailand. Financials. B&M European Value Retail. UK. Consumer Services. Bandai Namco Holding. Japan. Consumer Goods. Banco Santander Braz. Brazil. Financials.